AUTHOR: Kenneth R. Conklin, Ph.D.
Buy multiple copies and get big savings on shipping. This book is NOT available in bookstores. ORDER DIRECT FROM THE PUBLISHER, E-BOOK TIME, USING CREDIT CARD. This book is intended to awaken the sleeping giant of public opinion to the dangers of the Hawaiian sovereignty movement. The gathering storm of racial separatism and ethnic nationalism threatens not only the people of Hawaii but the entire United States. 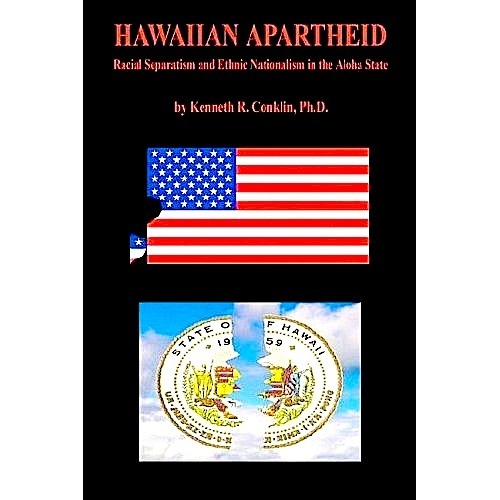 Racial separatists have had legislation in Congress since 2000 seeking authorization to create a racially exclusionary government with land and money taken from the State of Hawaii. The "Akaka bill" threatens to set a precedent for ethnic balkanization throughout America. Hawaii's independence activists want to rip the 50th star off the flag, either by international efforts or through the economic and political power the Akaka bill would give Hawaiians as a racial group. There are more than 160 federally funded programs that are racially exclusionary, plus the $8-15 Billion Kamehameha Schools. We must work hard to restore our fundamental principles of unity, equality, and aloha for all. The Table of Contents provides the titles of the chapters and their sections. How did the present trouble come about? If the Kingdom has maintained its continuity (although ineffectively in limbo), then why would today's Asians and Caucasians born in Hawaii not be Kingdom subjects fully equal to ethnic Hawaiians? The situation in Fiji is also a cautionary tale. Decolonization -- Is Hawaii legitimately the 50th state? "Treaties are the supreme law of the land." Is Hawaii legitimately the 50th state? What claims are being made, and for what purpose? Do ethnic Hawaiians qualify as an indigenous people by historical standards? Do ethnic Hawaiians maintain an indigenous lifestyle? Indigenous intellectual property rights yes; but in Hawaii? Quick review: What is Hawaiian apartheid? Why should it be of concern to people in Hawaii and throughout the United States? What would a positive future look like for Hawaii? What steps can we take to rescue ourselves? There's trouble in Paradise, and it threatens all of America. Racial separatism and ethnic nationalism are growing stronger in the Aloha State, with the U.S. as current accomplice and future victim. In a book entitled "The Gathering Storm" Winston Churchill described the rise of Nazi influence in Germany in the 1920s and 1930s. During the early years of the Nazi movement most Germans didn't realize how dangerous it was, and few outsiders knew or cared about it. When Hitler threatened to take over Czechoslovakia by military invasion, British Prime Minister Neville Chamberlain tried to appease Hitler by giving him part of it. Arriving home after a September 30, 1938 meeting with Hitler, Chamberlain stepped off the plane, waved a document in the air, and loudly proclaimed "Peace in our time!" Race-based institutions have grown so powerful they now control Hawaii's political establishment. A state government agency, eagerly supported by the Democrat legislature and Republican governor, is pushing Congressional legislation known as the Akaka bill. It would authorize a racially exclusionary government to include 240,000 citizens of Hawaii (20% of the state's population) and 160,000 citizens of other states.3 Most support for the Akaka bill comes from Hawaii's large race-based institutions seeking to protect the vast wealth and political power they already enjoy. Polls show that 2/3 of all Hawaii's people, including about half of the ethnic Hawaiians, oppose this bill.4 But the political establishment responds to the money and power of the institutions, and fears to go against a swing-vote of the 20% of citizens who have a drop of native blood and are regarded (wrongly) as a monolithic voting bloc. Some see the Akaka bill as a path to secession. Most independence activists accuse supporters of the Akaka bill of selling out; yet most supporters of the Akaka bill privately dream of eventual independence for Hawaii. Some independence activists accept the Akaka bill as a short-term pragmatic necessity to acquire ever-larger amounts of money, land, and power to fuel a drive for complete secession of the entire State of Hawaii from the United States. Hawaiian sovereignty activism is similar to "liberation movements" in other parts of the world, such as Quebec (Canada), Northern Ireland, Scotland, Sri Lanka, East Timor (Indonesia), Chiapas (southern Mexico), Kurdistan (southern Turkey and northern Iraq), etc. One wing of these movements appears to seek only self-determination, autonomy, and separatism within the existing system; while a more radical wing loudly demands total independence. The moderates view the radicals as pure-hearted idealists and often give them financial and "moral" support. The radicals often accuse the moderates of being bourgeoisie "sell-outs" but the radicals gladly accept whatever help the moderates give them. Hawaiian sovereignty activists believe international law supports their demands for independence. They also believe international law provides special rights for indigenous peoples, whereby the 20% of Hawaii's people who have a drop of native blood would be entitled to racial supremacy over the remaining 80%. The general public quietly tolerates and sometimes supports race-based governmental and private agencies. That public acquiescence encourages the activists to believe racial supremacy by law can be obtained peacefully. Over 160 racially exclusionary federal programs, plus massive state government programs, plus private race-based institutions valued at $8-15 Billion, already provide a substantial amount of racial supremacy to a group that also shares all the benefits available to everyone else. Racial supremacy by a zealous minority over a much larger but passive majority could continue and expand dramatically if Hawaii were independent from the United States, since there could no longer be interference from the U.S. Constitution or federal courts. Civil rights activists are struggling to protect the unity of Hawaii and the equality of all our people. One tactic has been to file lawsuits seeking to stop racially exclusionary practices. When race-based programs and institutions are threatened by civil rights lawsuits, politicians eagerly endorse the Akaka bill to shield them by creating an apartheid government. A state within the State of Hawaii (comparable to a state-recognized Indian tribe) would require only the approval of the state legislature. It is being pursued by the State of Hawaii Office of Hawaiian Affairs as a Plan B in case the Akaka bill fails. It's a way to empower a racially exclusionary governing entity which can acquire huge amounts of land, money, and political power. For starters it would gather under one umbrella all the housing, healthcare, schooling, and welfare functions already being performed by various racially exclusionary government and private institutions. With a membership of perhaps 200,000 (OHA's stated goal), this state within a state would have a position of power from which to pursue federal recognition through the Akaka bill, and eventual independence. The Hawaiian state-within-a-state could grow to more than 400,000, as large numbers of ethnic Hawaiians now in "diaspora" return to their "homeland" (where many have never been). At the end of 2006 nearly 60,000 of America's 400,000 ethnic Hawaiians have already signed a racial registry sponsored by OHA that would probably become the nucleus of the phony tribe's membership roll. Those who think it's acceptable to have a state-within-a-state based on race, ethnicity, or religion should look to the role of Hezbollah in Lebanon. Setting aside the violence, Hezbollah became politically powerful by providing healthcare, housing, and welfare benefits to thousands of people over a period of many years, thereby gaining their zealous loyalty. Hezbollah, like OHA, is an official agency of the government with the legal authority to appoint staff members to government boards. OHA, like Hezbollah, has a large pile of money, and the recognized authority to set government policy in many areas. It is clearly destabilizing for any government to allow ethnic or sectarian groups to establish and carry out official government functions. Hawaii is widely known as a paradise. We have a beautiful environment and excellent weather for enjoying it year-round. We are also known as a social paradise -- the most racially diverse and harmonious state in America, with the highest percentage of intermarriage producing the world's most beautiful children. Every racial or ethnic group in Hawaii is a minority. All are represented at every level of government, business, labor, media, etc. Governors and U.S. Senators have been Chinese, Filipino, ethic Hawaiian, Japanese, Jewish, and White. All races are found among owners of multimillion dollar corporations, laborers who work for them, farmers and fishermen, homeless people and prison inmates. Most neighborhoods have all racial groups represented among both homeowners and renters. We live, work, play, and pray in a fully integrated multiracial society. Many Hawaii citizens have a long list of ethnicities in their genealogies, and are very proud to recite them. It's perfectly normal for new acquaintances to ask each other: "Hey, what are you?" And it's perfectly normal to get the answer: "Chinese, Filipino, Japanese, Irish, German, and Hawaiian." But usually these days "Hawaiian" gets mentioned first, even if it's the smallest percentage of the pedigree (which it usually is). If there were to be an ethnic Hawaiian state within the State of Hawaii, its land base could only be filled with people through an exchange of populations similar to what was done when India (mostly Hindu) broke apart to create Pakistan (mostly Muslim). With ethnic Hawaiians comprising 20% of the state's population, and demanding more than 50% of the state's land (especially if Bishop Estate were included), the best name for the concept is apartheid -- which literally means "apartness." The exchange of populations might properly be described as ethnic cleansing. If there were to be an independent nation of Hawaii, its government and laws would be dominated by the 20% of the population who have at least one drop of native blood. That dominance has already been established through more than 160 federal programs, numerous state government programs, and dozens of wealthy private institutions, all providing racially exclusive benefits to ethnic Hawaiians in addition to the benefits available to all citizens (including also the ethnic Hawaiians). Racial supremacy by ethnic Hawaiians at present is somewhat limited by the fact that under U.S. law such race-based programs are probably unconstitutional -- some have come under challenge. But if Hawaii were to become an independent nation, then U.S. law could no longer protect a passive majority against a zealous minority using a theory of "indigenous rights" under "international law" to assert racial supremacy. Sovereignty activists try to soothe these fears by pointing out that most ethnic Hawaiians are themselves racially mixed, with non-native spouses and family members they would never wish to harm. The activists point out that Hawaiian culture is noted for its spirit of inclusiveness and generosity. But let's remember what happened in Germany in the 1930s, and in other places quite recently: Bosnia, Rwanda, Zimbabwe, Fiji, Darfur, Lebanon. People of different ethnic groups lived and worked side by side, and sometimes intermarried; until one group asserted supremacy, seized control, and engaged in ethnic cleansing accompanied by mass slaughter. History shows that bad things happen in multiracial societies when one ethnic group is given a green light to pursue racial separatism or ethnic nationalism. In recent years Hawaiian sovereignty activists have revived the celebration of Kingdom holidays. Although Caucasians were among the greatest heroes of the Kingdom, today's sovereignty activists shove them aside in their celebrations.7 This ethnic cleansing of Hawaiian history discloses a racist attitude and serves as the canary in the mineshaft -- a warning that ethnic cleansing of voting rights and land ownership are likely to accompany any form of Hawaiian sovereignty. "Native Hawaiians" are a dearly beloved ethnic group perceived as poor and downtrodden. Tycoons of the Hawaiian grievance industry have played upon the public's affection and sympathy to obtain numerous affirmative action programs. Over the years those programs multiplied and became entrenched as entitlements. Powerful, wealthy institutions funded by government and philanthropic grants have grown into an Evil Empire. Hawaii's favorite ethnic group comprises 20% of the population. Politicians (wrongly) assume they will vote as a bloc. Politicians fear the consequences of angering a 20% swing-vote. Thus the Evil Empire has captured Hawaii's political establishment. News media report and editorialize what politicians and noisy activists want to hear. Proposals for racial separatism or ethnic nationalism grab media attention, whereas proposals to protect unity and equality seem dull and are ignored. Newspapers print side-by-side articles: one favoring the Akaka bill as a way of getting more racially-earmarked money from the U.S. government, and one opposing the Akaka bill because it would damage the secessionist movement. But the argument in favor of unity and equality is not provided, even though the vast majority of Hawaii's people favor it, including probably most ethnic Hawaiians.8 This constant publicizing of opposing views of racial separatists and ethnic nationalists, while leaving out the aloha choice of unity and equality, is repeated so often that the public has come to believe that "something must be done" and that there are only the two (bad) choices. The news media also knuckle under to the separatists because the wealthy race-based institutions spend millions of dollars in advertising for propaganda to pass the Akaka bill and for people to sign up on a racial registry. Thus the Evil Empire has captured Hawaii's media. Hawaii's two Senators, Dan Inouye and Dan Akaka, have spent their entire Senate careers as members of the Indian Affairs Committee. Hawaii is the only state which has both of its Senators serving on that committee. In addition, Senator Inouye sometimes used his seniority to be Chairman of that committee when the Democrats were in the majority. Why would Hawaii's Senators want to serve on the Indian Affairs committee when there have never been any Indian tribes in Hawaii? The obvious answer is: filling the pork barrel. Whenever major legislation was introduced to provide housing, healthcare, or education for all of America's real Indian tribes, Inouye and Akaka made sure to insert "and Native Hawaiians" into the bills. Over the years more than 160 federally funded programs intended for real Indian tribes have brought billions of dollars into Hawaii for ethnic Hawaiians. Since this "free" money then circulates through Hawaii's economy, the business community and politicians like it. The race-based institutions are sustained and strengthened by federal dollars flowing through their coffers, while other institutions are co-opted by the money they earn providing services. Thus Hawaii's Evil Empire thrives with federal assistance and constantly pushes for more. The Office of Hawaiian Affairs has cited in legal briefs the fact that there are over 160 federally funded race-based programs for ethnic Hawaiians.9 OHA argues that the establishment of those programs over a period of about 30 years proves that there is a political "trust relationship" between the U.S. government and ethnic Hawaiians as a group. That claim of a political relationship is asserted in order to argue that the race-based programs are not subject to "strict scrutiny" under the 14th Amendment equal protection clause, but are subject only to a "rational basis test" appropriate to the government-to-government relationships between the U.S. on one side, and the states and the Indian tribes on the other. OHA's assertion of a political trust relationship and legal responsibility of wardship based on a pattern of generous giving can be shown as absurd by the following analogy. On Monday while walking down the street I encounter a homeless man holding out a tin cup, and I put in a dollar. On Tuesday while walking down the street I encounter the same homeless man holding out his tin cup, and I again put in a dollar. On Wednesday the same thing happens. Then on Thursday I'm a little behind schedule, and hurry past the homeless man without giving him anything. Whereupon he chases after me and shouts "Hey, where's that dollar you owe me!" He imagines that my pattern of generosity has established a "trust relationship" where he is entitled to expect regular handouts. Racial separatism (Akaka bill or Plan B) is not acceptable. Ethnic nationalism (secession, or total independence) is not acceptable. The status quo is not acceptable, because it allows an Evil Empire of race-based institutions to dominate Hawaii's politics and to continue entrenching racial supremacy while pushing for legislation to strengthen it. A third way is to persuade politicians to change the laws, or for the people to directly change the laws through ballot initiative or referendum. Of course the legislature will never voluntarily dismantle the Evil Empire. Initiative and referendum for statute laws are not available in Hawaii, except on extremely rare occasions when the legislature chooses to place an issue on the ballot. Individual small changes to the Constitution passed by the legislature are required to be placed on the ballot and can then be ratified or rejected by a vote of the people, but the people cannot initiate a law or amendment. Fortunately the Constitution requires that once every ten years the legislature is forced to place on the ballot the question whether there should be a Constitutional Convention. In 1998 the Evil Empire spent lots of money advertising for a "no" vote and they prevailed (narrowly, and on a technicality that blank ballots should be counted as "No" votes). Perhaps the outcome will be different in 2008. The combination of historical grievances and victimhood statistics comes out sounding like this (including false or greatly overblown "facts" and inflammatory rhetoric). In 1778 Captain Cook arrived in Hawaii bringing with him Western diseases for which the natives had no resistance. As a result, 95% of natives died within a century. Christian missionaries came to do good and did very well (for themselves). The natives looked up to heaven to pray, and then when they looked down they saw their culture and land were both gone. Genocide and land loss were accompanied by colonization -- natives were forced to assimilate to a strange new lifestyle while foreigners became dominant in the economy and political life. In 1893 the U.S. staged an armed invasion, overthrew the monarchy, imprisoned the Queen in her own Palace, and installed a puppet regime. That puppet regime made Hawaiian language illegal, further stripping the natives of their culture and making them feel like strangers in their own land. The U.S. followed an illegal procedure to unilaterally reach out and grab Hawaii through annexation in 1898, despite a protest petition signed by nearly every native and delivered to the U.S. Senate. The combination of genocide, colonization, overthrow of the monarchy, and forced annexation devastated the natives; and that devastation has continued to the present. Hawaiian natives have the lowest income and education among all ethnic groups, the worst health statistics (diabetes, breast cancer, short life span), highest rate of alcoholism, drug abuse, homelessness, and incarceration. The 1893 overthrow broke the hearts of the natives, and as a consequence their descendants today have the highest rate for heart disease. The U.S. owes huge reparations to native Hawaiians for the historical grievances, and to remedy the victimhood statistics they have caused. That's why native Hawaiians are entitled to over 160 race-based programs exclusively for them, a racially exclusionary private school system, a race-focused group of state-operated public schools -- and a proposed racially exclusionary government owning huge amounts of land and money taken away from the federal and state governments. Most of what is said in the above paragraph is false or terribly distorted. But the Hawaiian grievance industry has been pushing this propaganda aggressively for many years, assisted by the media, university, public and private schools, and the misguided Congressional apology resolution of 1993. Thus ethnic Hawaiians feel entitled to reparations, and the general public sympathizes with their "plight." Another tactic used by the Evil Empire is to claim that civil rights activists are being racist. This book will be attacked as racism against ethnic Hawaiians. The author has sometimes been publicly accused of being anti-Hawaiian. Such inflammatory personal attacks are typical behavior of the racial separatists and ethnic nationalists. They know it's very easy for a "person of color" to hurl the "R" word against a white man; and it is nearly impossible to defend against such slander. They know it's easy to evade serious discussion of the issues by smearing an opponent. They say "Why is it that you single out and attack Native Hawaiians, and only Native Hawaiians, when there are also other ethnic groups who have private clubs or cultural events?" Well, here's why. There is no other ethnic group in Hawaii whose leaders have over 160 racially exclusionary government programs, an agency of the state government with $400 Million in assets pledged to the master race, a private school system with $8-15 Billion, huge tracts of land owned in the name of the racial group, and who are seeking to establish a racially exclusionary government. The unity of Hawaii and equality under the law are not in any way threatened by the Japanese Cultural Center, the See Dai Doo Society, the Filipino Chronicle, the Narcissus Festival, St. Patrick's Day, etc. Sometimes the racial supremacists point out that the civil rights advocates attack only wealthy institutions like Kamehameha Schools while leaving alone the nearly bankrupt Lunalilo Home. It is claimed the civil rights advocates are jealous of wealthy Hawaiian institutions, want to seize control of the assets, or simply don't like seeing brown-skinned people do well. But of course the reason for not targeting Lunalilo Home is because it is truly a philanthropy not seeking political power. Queen Liliuokalani Childrens Trust is actually quite wealthy, and racially exclusionary. But until recently the QLCT, with a network of service centers, paid staff, and volunteers, has focused on its philanthropic mission. Perhaps eventually QLCT will become a target of civil rights activists, but so far it has escaped scrutiny because its wealth is not used for the purpose of seeking race-based political power. Civil rights activists do not target ethnic Hawaiians as a racial group. The attack is certainly not against most of the individuals who have native blood as one component of their ethnicity. The attack is against racially exclusionary programs, the powerful government and private institutions supporting them, and the drive for racial separatism and ethnic nationalism. Some very courageous ethnic Hawaiians have joined hands publicly with people of all races in Hawaii to actively defend unity and equality.14 Many more ethnic Hawaiians express support in hushed voices for fear of social, economic, or even physical retaliation by institutions and individuals who bully them into silence. However, there are also many ethnic Hawaiians who spew hate-filled rhetoric toward anyone lacking native ancestry, and especially toward whites. Newspapers frequently publish commentaries and letters asserting false or twisted historical claims using inflammatory language about "genocide", "colonization", "illegal" overthrow of the monarchy, "stolen" lands, "language made illegal", etc. So, how should others think of ethnic Hawaiians? Should we fear them? Should we see them as enemies, hell-bent on ripping Hawaii apart and ripping the 50th star off the American flag? Should we give credence to the highly touted victimhood statistics and thereby racially profile ethnic Hawaiians as poorly educated, impoverished, diseased, drug abusers, spouse abusers, likely to be incarcerated? No doubt some are like that. Perhaps too many are like that. But most are just like everyone else, loving their families, working hard to pay the bills, getting wealthy or falling into poverty according to their efforts and abilities, and proud to be Americans. How we should think about ethnic Hawaiians is similar to how Americans should think about Arab Muslims after September 11, 2001, or how we should have thought about Americans of Japanese ancestry after December 7, 1941. Let's remember that after the Japanese attack on Pearl Harbor many Americans feared American residents of Japanese ancestry -- even native-born or naturalized. There may indeed have been a few Japanese Americans with close ties to the motherland who would have spied for Japan or tried to engage in sabotage. But the overwhelming majority of those who were incarcerated in relocation internment camps turned out to have been victims of a great injustice. Here in Hawaii most ethnic Japanese were spared such injustice and continued to be treated as the friends, neighbors, and family members they had always been. Let's think about how Americans feel today about Arab Muslims. Our news media are filled with images of hate-filled zealots cutting off heads, blowing up suicide bombs, or flying airplanes into skyscrapers. Some nations' presidents or prime ministers call for the destruction of America. Yet our hearts and minds tell us that most Muslims in America -- and even the ordinary Arabs and Muslims living in rogue nations like Iran and Syria -- are just like us, with loving families, generous hearts, and peaceful intentions. It's wrong to consider a person's race or religion as his most important attribute. How should we think of ethnic Hawaiians, Japanese, or Arab Muslims? We should be careful to think of them as individuals and, as Dr. Martin Luther King said, judge them by the content of their characters rather than the color of their skins. A person's race alone tells us nothing at all about whether he is rich or poor, intelligent or stupid, upright or corrupt, egalitarian or racist, friendly or hostile, peaceful or violent. Neither a person's character, nor his individual rights and needs, should be profiled based on race. That principle applies to avoiding prejudice, but it also applies to giving benefits or detriments based on race alone. Therefore we should give government assistance to needy people based on need alone and not race. If one racial group is really more needy than others, then it will receive the lion's share of government help when help is provided based on need alone. We should never allow creation of a government defined by race. Institutions made evil by racial exclusion or racial zealotry should be rehabilitated by forcing them to give up such policies. Powerful institutions where race is the primary defining factor, and which seek race-based political power, should be destroyed if they are unable or unwilling to be rehabilitated. Innocent people caught in dependence upon such institutions (both employees and beneficiaries) should be treated with kindness, should not be blamed for the evil of those institutions, and should he helped to escape. 5 A map of the Hawaiian islands showing some of the lands likely to be demanded by an Akaka tribe is available in pdf format at http://tinyurl.com/bgx25 There are large and small land parcels, SCATTERED throughout the islands, making jurisdictional issues a nightmare. Almost every current business would eventually come under competition from untaxed and unregulated businesses located within easy driving distance.